Individuality finding harmonious expression in ensemble – this has to be the quintessence of the Vogler Quartet, an ensemble which can claim the distinction of retaining its original membership since its formation in 1985. 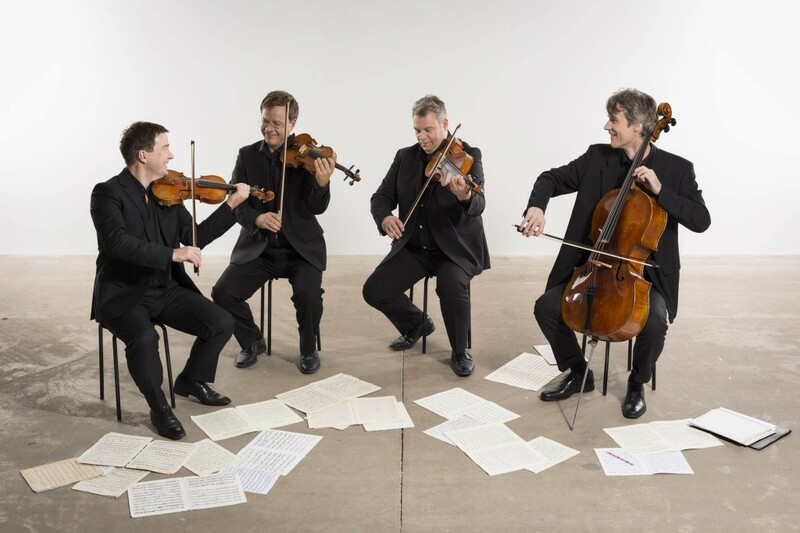 With an intelligent approach to the genre of chamber music, a brilliant playing technique, interpretive tactfulness and a vibrant ensemble spirit, Tim Vogler, Frank Reinecke, Stefan Fehlandt and Stephan Forck have created a unique string quartet sound which consistently offers new insights into the genre. This East German ensemble had its beginnings at the Hanns Eisler Musical Academy in Berlin. It became internationally renowned in 1986 only one year after its foundation as the first prize winner of the famous Evian string quartet competition. Eberhard Feltz, György Kurtág, and the LaSalle Quartet, notably Walter Levin, subsequently sponsored the quartet and became influential mentors. The ensemble’s extensive repertoire of classical literature from Haydn to Bartók as well as the Second Viennese School is complemented by both contemporary and lesser known works. The four musicians have performed compositions by Karl Amadeus Hartmann and Morton Feldman, including Feldman’s monumental Quartet No. 2. Together with the Arditti Quartet, the group organised a cycle of Rihm’s works at the occasion of the EXPO 2000. Among the world premières are compositions by Moritz Eggert, Frank Michael Beyer, Ian Wilson, Jörg Widmann, Mauricio Kagel, and Erhard Grosskopf. The world première of a string quartet by Taner Akyol is scheduled for July 2014. The Vogler Quartet actively broadens its field by collaborating with renowned artists. During its long career the group has performed with Lynn Harrell, James Levine, Bernard Greenhouse, Boris Pergamenschikow and Menahem Pressler. Projects are also underway with Ute Lemper, Salome Kammer, Tatjana Masurenko, Jochen Kowalski, Jörg Widmann, David Orlowsky, Finghin Collins, and Oliver Triendl. The four musicians are as much at home in the musical centres of Europe as they are in America, Japan, Australia, and New Zealand. They have performed in all the major venues and featured in many European and American chamber music series. Since 1993, the quartet has organised its own concert series at the Berliner Konzerthaus am Gendarmenmarkt (The concert hall at the Gendarmenmarkt in Berlin). In early 2000 they began a concert series in the city of Neubrandenburg, and in the same year began the annual chamber music festival “Music in Drumcliffe” in Sligo, Ireland. In 2002 they took over the artistic direction of the Kammermusiktage (chamber music festival) at Homburg/Saar in Germany. Besides their concert activities, the musicians actively sponsor young talent. They teach classes at colleges in Berlin, Leipzig, Stuttgart, and Dublin, and give master classes for professional quartets in Europe and overseas. As the successor of the Melos Quartet, the Vogler Quartet has also held the chair for chamber music at the music college in Stuttgart. The instrumentalists are among the most active German chamber music ensembles working with youth and children. They have initiated numerous projects during the annual chamber music festival “Music in Drumcliffe” in Ireland and since 2005 at the award winning “Nordhessische Kindermusiktage” (The North Hesse Children’s Music Festival). The discography of the Vogler Quartet features a number of highly praised recordings for BMG/RCA, Nimbus, col legno, and cpo. Since 2005, the ensemble has been represented under the Günter Hänssler “profile” edition, and has released Schubert and Mendelssohn interpretations on this label. The album “Paris Days – Berlin Nights” with Ute Lemper and Stefan Malzew (released on the Sony label) was nominated for a Grammy award. The quartet is currently recording the complete quartets by Dvorák for cpo. In April 2014, the Vogler Quartet will publish a tango album in collaboration with bandoneon player Marcelo Nisinman for “Phil.harmonie”.